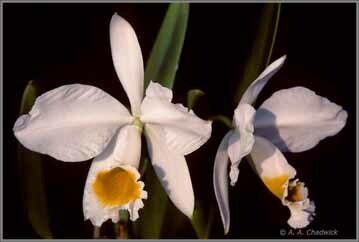 The mid 1800s was the great age of discovery for the large-flowered Cattleya species. The first species were found by private individuals and government workers living or traveling in South America who sent the plants back to horticultural friends in Europe. As the age progressed, however, most of the species were discovered by professional plant hunters working for large commercial orchid companies. One of the most successful of the commercial orchid companies who introduced new Cattleya species was the Belgium firm L’Horticulture Internationale owned by Jean Jules Linden. Linden’s first great success was Cattleya trianaei which a native Colombian named Jose Triana sent him in 1854. He thanked Triana by naming the species for him. Linden’s collector, Gustav Wallis, sent him the first plants of Cattleya dowiana aurea from Colombia and Cattleya eldorado from Brazil shortly after he introduced C. trianaei and this was only the beginning. After a company received a shipment of a new Cattleya species, their biggest problem was how to tell potential customers about it. If the plants were sold at a public auction house, the word got out quickly and most hobbyists knew about it within a week or two. If the company had to wait for people to come to their greenhouses to tell them about the plants, it could take a few more weeks and sometimes months. If the company had to wait for a botanist to describe the new species in one of the popular horticultural newspapers like The Gardeners Chronicle it could take years. It took Linden six years to convince the botanist, H. G. Reichenbach to write a botanical description of C. trianaei and Reichenbach put the description in a German language publication that none of Linden’s customers could read. If a company was lucky enough to have a botanical description put in The Gardeners’ Chronicle, the company was not sure the plant would be described as a new species or just a new variety of an old species, Cattleya labiata – which made a huge commercial difference. Since cattleyas had enormous horticultural value in the mid 1800s, but only a modest botanical one, the vacillating opinions of botanists became a major problem for orchid companies as newCattleya species were discovered. To protect their investments, the owners of these companies finally ignored the botanists and began deciding for themselves whether the latest cattleya discovered was a new species or not. They gave the plant a name and sold it all over Europe and the botanists be damned. This is why several of the large-flowered Cattleya species discovered after 1866 have initial botanical descriptions that are a bit sketchy to say the least. After the horticultural world had thoroughly accepted these species, of course, a botanist eventually wrote a proper botanical description using the established horticultural name which made sense for both science and horticulture. Giving the species a new name, of course, would have been a disservice to everyone regardless of the botanical protocol. One Cattleya that had no problem being introduced as a new species was Cattleya eldorado. Gustav Wallis had sent Linden over 700 plants of C. eldorado in 1866 and they arrived the season before Linden was to put a large exhibit in the International Exposition of 1867 in Paris. The plants became well established during that year and were in flower in time for the exposition andC. eldorado virtually exploded onto the horticultural scene that summer. To put the new plants in his exhibit, of course, Linden had to give them a name and his decision to call them “Cattleya eldorado” was nothing short of brilliant. The name told his customers the plants came from a whole new area for Cattleyaspecies, yet it told his competitors nothing about where to find them since the mighty Amazon and its many tributaries covered an area larger than Europe. With several hundred plants in full bloom and sporting a range of colors not seen since the introduction of C. trianae, the demand for C. eldorado was sizable even during the exposition. Since Linden had so many plants to sell, he made a handsome profit on them and established a new species of Cattleyaalong the way – although an occasional botanist is still fussing over who wrote a good botanical description of it first. Cattleya eldoradobecame the darling of the 1870s and its popularity continued for over two decades. Linden made so much money on the species, he often featured it in beautiful color lithographs in his magnificent book Lindenia as his collectors sent him more and more plants to sell. Cattleya eldorado was not an easy plant to grow because it did not fit the familiar model of the great mountain Cattleya species like C. trianaei, C. mendelii and C. warscewiczii that flourished in the high cloud-forests of the Colombian Andes. C. eldorado grew in the hot, steaming jungles of the Amazon Basin and it did not like the chilling night temperatures of the mountains. It was a remarkable species, however, that not only had a wide range of color forms but some of the longest lasting flowers in the whole Cattleya genus. C. eldoradowas also a relatively small plant with only 5 or 6 inch tall pseudobulbs. The pseubobulbs, however, produced an abundance of medium sized, traditional-shaped cattleya flowers that had a distinct lip pattern that could not be mistaken for any other species. European growers eventually mastered its growing requirements but not before they killed a lot of plants. As the years went by, however, the abundant large-flowered giants of the Cattleya genus like C. labiata, C. warscewiczii, C. mossiae andC. trianaei, slowly eclipsed the more modest, diminutive beauty ofC. eldorado and by the early 1900s, C. eldorado had become a rare plant in cultivation. Although a few plants were imported during the 1940s, the species largely disappeared from hobby and commercial greenhouses in the United States and Europe after that. I found it extremely difficult to find plants to use to take pictures for my article on C. eldorado in the June, 2002 issue of Orchids and actually had to import some plants myself two years earlier so I could write the article. Fortunately, C. eldorado has not totally disappeared from orchid collections in the United States and one of our Delaware Orchid Society members, Anthony Alfieri, decided a few years ago to make a project of collecting some of the finer varieties of C. eldorado and made several importations of them from Brazil. He has graciously allowed me to take pictures of them as they bloomed over the past season so readers can see how appealing the species was in its heyday in the late 1800s. Dr. Alfieri also has a large collection of all the other large-flowered Cattleya species and has done much to enhance the popularity of these species in our local area. C. eldorado is certainly a rewarding Cattleya species to grow and although it still does not seem to be available from commercial growers in the United States, it continues to be available from several commercial orchid companies in Brazil. Most of the plants I have seen for sale were raised from seed from old jungle-collected varieties, so they can be accepted by hobbyists as environmentally friendly even though they come from the native country where C. eldorado grows naturally. How to Grow Cattleya eldorado. Cattleya eldorado is one of the more difficult members of theCattleya genus to grow well in northern greenhouses. It requires a warmer night temperature than most of the other large-flowered species and should be kept in the warmest part of the Cattleyahouse. I find it does best at a night temperature of 65 to 70 F. C. eldorado needs a good amount of sun to flower well and produce its 4 to 5 flowered bloom spike. With insufficient sun, the plant will usually produce only one or two flowers on a spike. C. eldorado will normally begin growing in early spring in the United States and, as the lead is still actively growing, buds will appear in the emerging sheath and these will open in early summer as the growth matures. After the plant flowers, it will begin to root and can be repotted at this time. The plants should be kept as dry as possible after flowering and given only enough water to keep the new roots moving down into the medium. If the plants are given lots of sun and kept dry, an eye will often break in about two months and produce a new growth that will flower in December. If the plant is allowed to make a new growth immediately after it flowers, the plant will usually not produce a second flowering and will rest after the growth matures until it begins to grow again in the early spring. The summer flowering usually produces the best flowers probably because of the higher temperatures and humidity at that time of year.